This is a Demo I did for the class I taught on Monday. We went though composition and focused on tone to create dramatic paintings. This pear reminds me of someone on stage giving a dramatic monologue where a self centred actor is really getting off on the attention. 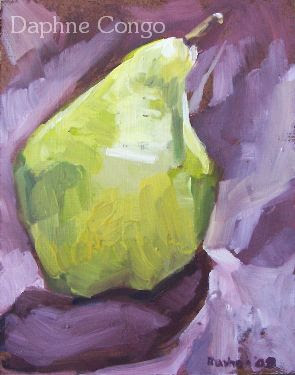 I always seem to personify pears. They are so shapely and seem to have such personality and character. They like to pose for me too.